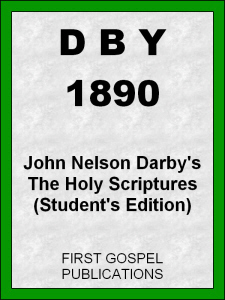 This study Bible version called, DBY 1890 John Nelson Darby's the Holy Scriptures, comes complete with both the Old Testament (OT) and New Testament (NT). Also includes topical outline of every chapter; all content optimized for mobile, touch and e-reader devices. The portable Holy Bible at your fingertips... ready to read, study and share! Download & Enjoy this eBook Today! First Gospel Publications © 2012  All rights reserved. Kindle, Kindle Fire, Amazon, the Amazon Kindle logo, and the Kindle Fire logo are trademarks of Amazon.com, Inc. or its affiliates.